Symbolising the coming spring, the unmistakable scent of hyacinth signifies new life and hope. Here, it mingles with aromas of stocks, honey, dew covered grass and leaves. Luxurious ceramic vessels with stunning floral scents as delicate and pure as porcelain. Inspired by flowers from around the globe, such as Japanese Cherry Blossom, Italian Neroli and Mexican Tuberose. 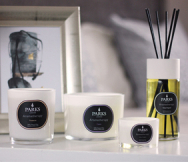 These graceful, simple, fine fragranced candles offer generous burn times in a luxurious white ceramic for indoors and out.